I recently purchased a Motorola Razr v3m phone. My previous carrier used the T-Mobile network (whose reception was iffy at best in my area), so my new carrier uses Verizon, whose coverage is far superior. Unfortunately, though, the v3m is hobbled beyond belief! Aside from Verizon's typical anemic interface for its v3 series phones, the phone provides no easy way to add custom ringtones, for example, in my case from my Windows 7 desktop. The phone itself even has a slot for a micro SD card, but this card is completely inaccessible from the phone's UI. Motorola Phone Tools, the software that usually allows you to quite easily copy multimedia from your PC to your phone, had no such options available for the v3m. A few phones back I'd owned a Razr v3c, and it at least allowed you to craftily send a text message with an attached MIDI file which you could then assign as a ringtone, but no such luck with the v3m. Verizon has gone out of its way to funnel customers through its online marketplace for the privilege of obtaining custom ringtones, wallpapers, pretty much anything. After poring over numerous forum threads from people trying all kinds of workarounds, and trying some dozen different methods, I had no luck whatsoever. However, finally I found a solution which enabled me to not only add my favorite MP3 ringtone (which happens to be the "dying phone" one from the movie Crank), but also freely modify and transfer photos and wallpapers and other stuff. Now, before I outline the steps, here is a ZIP file containing all the utilities which worked in my particular case. Download this file, then follow these steps. 1. Click twice on MotorolaDeviceManager_2.4.5.exe. This will install the drivers for three devices which Windows 7 will need to talk to the Razr v3m, the Motorola USB Modem, Motorola USB Diagnostic Port, and the Motorola USB Compositive Device. Note that these devices will only appear in Device Manager when the phone is actually plugged into your PC via USB. 2. Now, run the file bitpim-1.0.7-setup.exe, which will install the BitPim utility. 3. 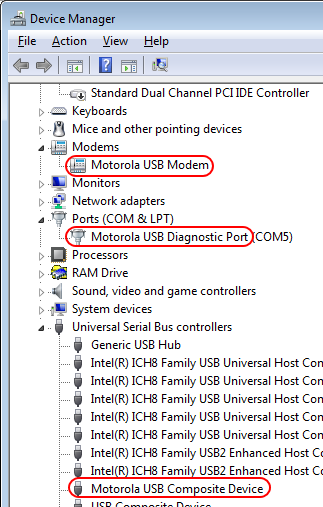 Assuming you've successfully installed the Motorola drivers in step 1, connect your PC directly to your v3m via USB cable; some have reported problems going through a USB hub. Windows should recognize the phone and begin setting up the drivers for the hardware. Wait for Windows to successfully recognize the hardware before proceeding. 4. 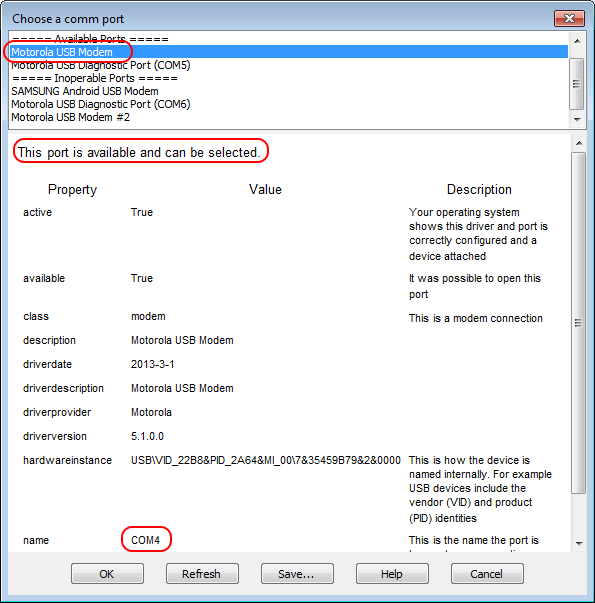 In Device Manager, right-click on the Motorola USB Modem, click Properties, click the Advanced tab, and then click the Advanced Port Settings button. This will reveal the COM port the device uses, which is important for the next step. 5. Open BitPim. If prompted that no phone has been detected, hit OK and ignore that for now. Click Edit => Settings, and first ensure that v3c is selected as the phone type (yes, v3c, not v3m). 6. 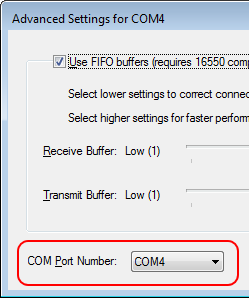 Click the Browse button, and in the Choose a comm port screen, click on Motorola USB Modem (which should be listed as an option under Available Ports if it was detected successfully by Windows), and verify that the message about the port being selectable is displayed, and that the COM port number corresponds to the COM port in Device Manager identified earlier. 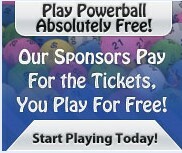 Click OK assuming all of these check out. After following the above steps, you should now have access to your Razr v3m's ringtones, wallpapers, and more. 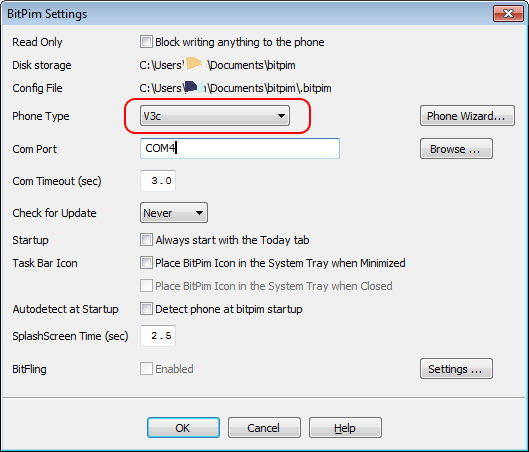 I refer you to BitPim's online help to get some tips on how to actually use BitPim to interface with your phone. I've found with my phone that MP3 ringtones for the v3m must be less than 300 KB in size, and have a bit rate no higher than 192 kbps. Also, the length of the actual tone must be under 30 seconds. However, your experience may differ depending on your phone's firmware and options. 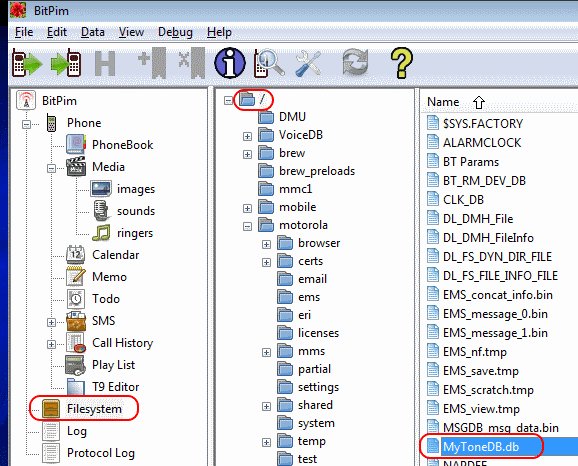 Upon adding custom ringtones to your v3m, you should navigate the phone's file system as illustrated below, first by clicking Filesystem in the left-hand pane, then clicking the forward slash at the very top (the "root" of the file system). If you don't see any folders or files beneath the root, you can right-click in the white space in that middle pane and click "Refresh Filesystem". Once you can see the files and folders, click on the root up top, and delete the file MyToneDB.db. Then, next chance you get, power the phone off and then on again. This will cause the phone to rebuild its ringtone index to include your custom tones.